Will Orthopaedic Shoes Help Me? Supportive, well-fitting footwear plays a vital role in keeping you mobile and pain free. However, wearing appropriate shoes is sometimes not enough if you have certain foot conditions and foot types. If this is the case, you may require orthopaedic shoes. Orthopaedic shoes are shoes that are specifically designed to support or accommodate the mechanics and structure of your foot, ankle and leg. a brace that requires specialized footwear to accommodate it. If you think you may need orthopaedic footwear, book a consultation with us, a foot expert, to conduct a full assessment of your lower limbs and tell y ou which orthopaedic features you require for your foot type and condition. Where can I purchase orthopaedic shoes? Although some retail outlets specialize in hard to fit feet and orthopaedic shoes, orthopaedic footwear is usually found in stores and clinics that have a resident foot care specialist. A Pedorthist can adv ise you on the best orthopaedic shoes for you and make sure they fit your feet properly. Do I need to wear my orthopaedic shoes all the time? Depending on the shape of your feet and the nature of the condition you may need to wear your orthopaedic shoes most, if not, all of the time. However, some people need only wear their orthopaedic shoes while at work or when they are active or standing for a long period of time. 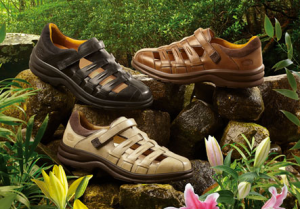 Are orthopaedic shoes just for seniors? Nope. Although changes in foot structure and biomechanics associated with aging may require orthopaedic shoes, poor foot mechanics can affect peoples of any age. More stylish alternative exist than in the early days of orthopaedic footwear so we can usually accommodate your fashion tastes, as browsing through our products will show. Are all orthopaedic shoes the same? Nope. They come with a variety of different features to accommodate for various foot conditions and mechanics. We can help you navigate the options and find the footwear that will help your situation. What orthopaedic features should I look for? Appropriate heel counter — that back part of your shoe is very important depending on your medical need. A stiff heel counter will provide much needed stability and control excessive rolling inward/outward while soft heel counters would protect a sore bump on the back of your heel. Torsionally strong midsole and outsole — proper footwear should provide a stable base for the foot and not twist or bend easily in the midsole. This is an area to watch when purchasing footwear in general, as this is one area where some manufactures try to eliminate weight by carving out the arch under the foot. This also makes footwear appear slimmer. but not always desirable. The Skinny on Flip Flops. Nothing says summer like a pair of fashionable, lightweight flips flops, but when you reach for your summer footwear you should always think about balancing style and ease with comfort and support. Basic flip flops, particularly bargain-basement brands, do not provide the support, motion control and cushioning your foot requires during walking. However, some footwear companies design flip flops with the health of your feet in mind. Don’t be tempted to buy a pair that doesn’t fit just because it looks great. If your feet are too wide or your heel or toes hang over the edge, they are not right for you. Look for flips flops that have a thicker sole, a slightly thicker heel, an arch contour and a deep heel cup as these features will provide the support and shock absorption your feet need. Flip flops are usually made out of material that softens or stretches over time, so be sure to only buy ones with thick enough, or adjustable, straps that will keep your feet anchored in the correct spot even as the flip flops age. If last year’s flip flops are misshapen or no longer hold your foot securely, throw them out. The best advice is to limit wearing flip flops as much as possible. 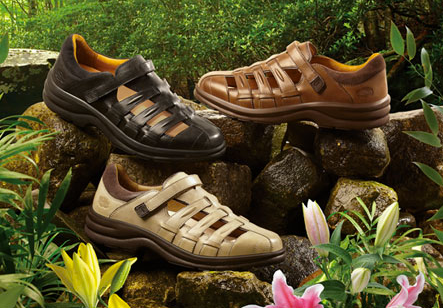 Choose a more supportive sandal with a contoured footbed that supports your arch and cups your heel. Your feet will appreciate it. The industry has come along way from your grannies’ orthopaedic shoes, and fashionable yet functional summer sandals are now available with removable footbeds that can accommodate custom foot orthotics. Come in to see if your will thrive in summer sandals with your foot condition and see what’s available to wear for your summer fun. Toe wiggle room – To allow your feet to function properly, there should be a minimum of 1/4″ of space in the shoe beyond the longest toe of your largest foot. This should be measured while you are standing, as your feet expand while weight bearing. Cushioning – Although cushioning is important, too much cushioning forces your foot and leg muscles to work overtime to provide stability. These are just a few helpful pointers to help you select proper footwear. If you are experiencing foot pain or discomfort, you should consult a Canadian Certified Pedorthist for pedorthic management services including orthopaedic footwear, shoe selection guidance and orthotics. Foot injuries account for 10% of all reported disabling injuries in the workplace in Canada. According to Canada’s National Occupational Health and Safety Resource, 2 out of every 3 workers in Canada suffer from some sort of foot problem in their lifetime. Long periods of standing, repetitive motions, improper foot alignment and improper footwear can lead to muscle and ligament fatigue which increases the risk of injury and damage to bones, joints, muscles, ligaments and other tissues of the feet. The resulting inflammation and abnormal wear and tear can lead to conditions such as Plantar Fasciitis (heel pain), Metatarsalgia (pain at the forefoot) and Repetitive Strain Injury. When purchasing shoes, select a stable shoe with a sturdy heel counter (the back of the shoe that controls motion) and stable midsoles that provide shock absorption. Purchase lower heels and broad soles to provide a more stable base of support. Look for lace-up shoes as they offer more support than Velcro or slip-on shoes. Fully lace your shoes/boots every time you put them on to maximize support. Replace workplace shoes and boots at least every 6 – 12 months or when your body first starts showing signs of fatigue. If a foot injury occurs, seek help from a physician. Don’t let a small problem turn into a big problem. Consult with a Canadian Certified Pedorthist for specific recommendations for your workplace and foot type. Can all shoes be modified? Most orthopaedic shoes- a shoe specially designed to provide support and comfort for people with lower limb conditions – can be modified. Canadian Certified Pedorthists are also able to make modifications to many standard and athletic shoes. However, not all footwear can be modified. At Sound Orthotics, we will advise if modified shoes are right for you and review all the options available with you. Together, we can determine which choice best meets your medical needs, lifestyle and style. What is a modified shoe? Modified shoes are everyday footwear that have been professionally altered to address the specific needs of an individual’s feet, and accommodate their foot condition. Modified shoes may have one or more custom adjustment. Many modifications are hidden within or beneath the shoe so modified shoes often look like regular footwear to the untrained eye. What conditions can modified shoes help to treat? What is a shoe alteration? Footwear alterations are not considered permanent footwear modifications and are generally used to fine tune the fit or support of a shoe.